3 Crew seems light. Pilot, Copilot/engineer/Navigator, Bombadier/Radio operator & rear gunner? Otherwise she's similar to the T.V, a little less payload, and little lighter but that is easily explained by less wing area/max ratings. The guns are all in the nose. The plane is small designed as a light attack craft for close air support. Payload wise, I think it might be pushing it. So the dorsal feature is for navigation shots? Hmm we have different definitions of small. She is several meters smaller than the historic T.V., which had a 1,000kg bombload but otherwise very similar stats. It is a small plane. It's a funny point to disagree on. I think for me, once the wingspan is over the 50ft mark, "small" is questionable. The plane is physically 25% longer with a slightly larger wingspan and ~50% greater max weight. I will note the Devastator is also a 1,000lb bomb bird. The comparable historic T.V, also mixed construction with the same general engines, range, etc, managed 1000kg. So I think your limitation of 500lbs, if not based on Planebuilder, is likely overcautious. As for construction type, the mixed is likely safe and could widen the worker base to include older ones, but metal fabrication has been about some time now. However, while I think the stats slightly conservative, that is not a stumbling block. Nice pic. The CR.25 was a nice design and very reliable as a transport. 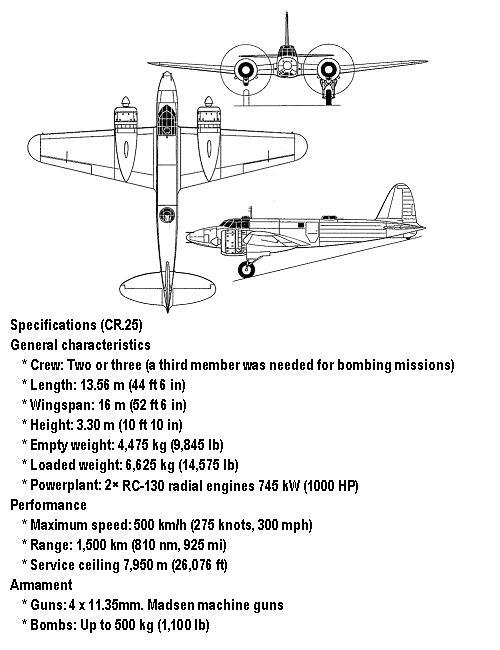 Its fairly comparable to the Beaufighter, suitable for patrol and ground attack duties as well. I'm working off the basis of the Caproni 310 series as the next batter up. Those planes were dogs. Entirely agree about the CR-25, It was an excellent little plane, shame is that it lost out to the Caproni 310s.